There will be several remarkable pieces on the set of Norman Bray in the Performance of his Life. They include a chair, a bed and some pieces of cabinet furniture, like a desk, all made of corrugated cardboard. Designed by the creative genius of Beckie Morris, Production Manager for Theatre Orangeville, they reflect the conflict in the mind of Norman Bray between the stark realities of his life and his own happier delusions of greatness. Reality versus dreams. As a matter of survival, Norman Bray is a narcissist, a dangerous buffoon inasmuch as he has the control of his environment and that of his step-daughter, Amy, with whom he shares the home in which she born and which he is meant to maintain after the death of his wife, Amy’s mother. Shielding himself with the appellation of “artist,” Norman dodges all responsibility for his past, present and, if possible, his future, including the impending loss of the house which he and Amy call home. 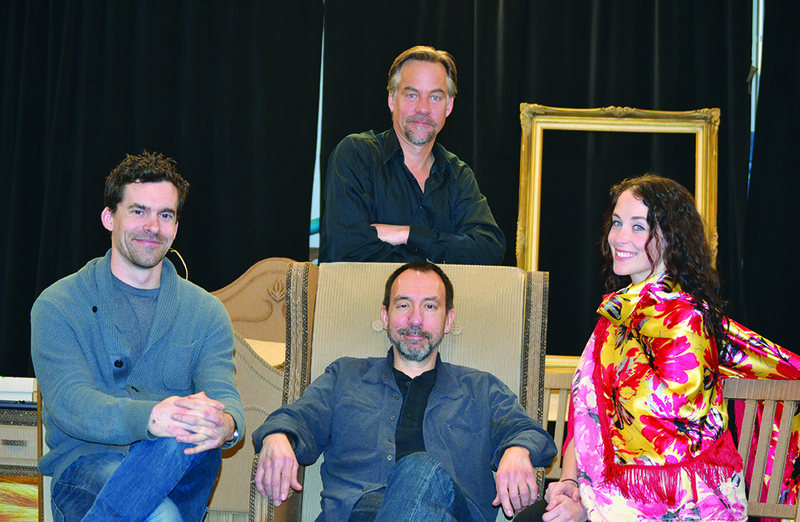 In an interview with the Theatre Orangeville cast, we learned something of the personalities and imponderables brought to light through this drama. He can’t bear to have a bad thought: “I am an artist!” he declares as defense for any of his failings regarding practicalities. “It’s really about facing life – what’s important to you – and that’s the people in your life,” Heidi Lynch explained. For this is a play about actors and the theatre business. All the foibles and pitfalls of having an acting career, all the rationalization of an actor explaining himself to an non-acting family – so much of what artists and actors experience outside the make-belief world of film and theatre, which has its own realities, after all, is brought into the light by Norman Bray. There is an opportunity to meet the author of Norman Bray, Trevor Cole, next week. This play is based on the first of his three novels, published in 2004, and it, too, is titled Norman Bray in the Performance of his Life. It was nominated for the Governor General’s Award. Mr. Cole will be at the Mill Street branch of Orangeville Public Library just before the preview performance of his play on Thursday – April 9, 6:30 to 7:30 p.m. – for an author talk. This event is free. This is the world premiere of Norman Bray in the Performance of his Life. Everyone involved with it is certain it will be picked up by other theatres, as it is such a good play, so finely written. 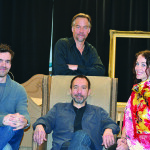 And as a premiere, the play’s future largely lies in the hands of this theatre and Theatre Orangeville’s audiences. Those initial performances and the reaction of the audiences will hone and define the productions that follow in other theatres. This, of course, is part of Theatre Orangeville’s mandate and the reason for its New Play Development Fund. The cast members, too, are acutely aware of their own parts in the play’s future, not only with reference to their performances in this production but also as the people defining the play by how they interpret the roles. “It’s going to be one of our finest moments,” remarked Mr. Griffiths. Norman Bray in the Performance of his Life opens April 9 and runs until April 26. Meet the author, Trevor Cole, to talk about the play at the Mill Street Library, from 6:30 to 7:30 p.m. as a free event next Thursday, April 9.